Shearwater’s annual Wearable Arts Performance has become the highlight of the School year. The event draws together hundreds of artists, performers, and entertainment industry professionals and runs over three nights. Performances sellout and it pays to book well in advance. Wearable Arts blends theatrics and choreography, seeking through the magic of dance, music, drama, lighting, costume and pageantry to focus on the performer – the human being as a measure of all things. Add to these the craft arts of fabric design, felting, weaving, printing, jewellery making, body decoration… and you’ll possibly agree that this event is a synthesizing of all the arts! An independent panel of judges award donated prize money to category winners and to an over-all grand winner. The content and production of the performance is something that is integrated into the learning program of the students and the professional development of the staff. 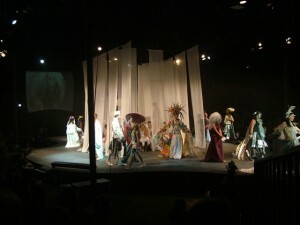 Eighty percent of the staff and high school students are creative participants in the show and its production. It is in this active engagement that higher learning takes place. Eighty years ago, Rudolf Steiner recognised the pressures that modern technology would bring to human life and brought into being an art of education that would nurture the qualities required to deal with its demands. Following Steiner’s indications, Shearwater has implemented a lively imaginative and action based education that incorporates the human-centred wisdom of artistic process. 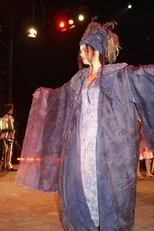 The Wearable Arts Performance Event is an active engagement and fulfilment of these ideals. Learning is taken from the abstract and the virtual, finding conclusion and fulfilment in a meaningful and appreciative community event. It is in these live events that the elusive values so much sought by Federal Government initiatives find expression: working co-operatively as a team, peer support, veneration, respect for others (and for self), commitment, dedication, working for something greater than the self, striving for excellence and love of life. Abstract values can reveal themselves as living realties through the creative agencies of this new incipient art form. An imaginative Wearable Arts production is a synthetic fusion of all the art forms present in drama, story, dance, modelling, music, costume, pageantry, sculpture, textiles, fashion and craft. Wagner called it Gesamtkunst. To this we have added the Art of Education. The library has a wide selection of books available for loan to students, staff and parents. The library is open every school day during term time from 8am to 4pm, and is attended by a full-time librarian. In addition to books used for reference and in class, students are encouraged to borrow books to read at home or in school. There is also a large reference section (reference resources, magazines and newspapers). As well as traditional print material, the Library has computers and digital resources to allow integrated access to IT resources. Computer access is limited to staff and High School students. Picture books are available for the younger students, and there is a wide selection of non-fiction and fiction for both the primary and secondary classes. 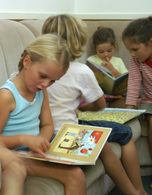 Primary school classes have a library lesson every week in which they can borrow books and listen to a story. The school also has a comprehensive range of Rudolf Steiner and related Anthroposophical titles available for loan. Parents are encouraged to join the library, for which there is a membership fee of $25.